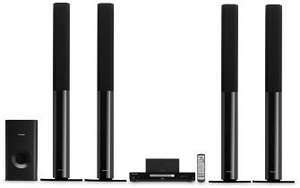 Pioneer DCS370 DVD Home Cinema System with HDMI, USB and Tallboy Speakers. Powerful DVD and music entertainment system. The DCS-370 is a 360W home cinema system that will play your entire DVD and music collection: it is multi-format. If you frequently download movies from the internet, the system can also playback DivX files. Alternatively, you can play your MP3, WMA or AAC (iTunes) files through the USB host; simply plug-in your USB memory stick or music player. what price are these usually? anyone know if these are any good for the price as I am looking at getting surround sound for this sort of price but don't know too much about 'em? wtf?? Why would there be wear and tear, are they second hand or just display or what? 3 or 4 years old....sounds like very second hand from the description? No warranty details on the website..